Construction Safety Week runs from May 7-11 this year and aims to highlight the importance of a safe and hazard-free workplace for construction workers across the country. Construction Safety Week 2018’s slogan, “We are stronger and safer together,” serves as a reminder of how powerful a mutual understanding and respect of safety can impact the workplace. For five days starting May 7th, construction workers and employers across the U.S. and Canada will band together to make safety a priority and limit the number of preventable accidents that take place every year. With heightened awareness of safety in the construction industry, workers, employers, and managers are encouraged to consider how they can make their workplace safer for everyone. Construction Safety Week provides encouragement and resources that can build awareness and excitement around safety in the workplace. 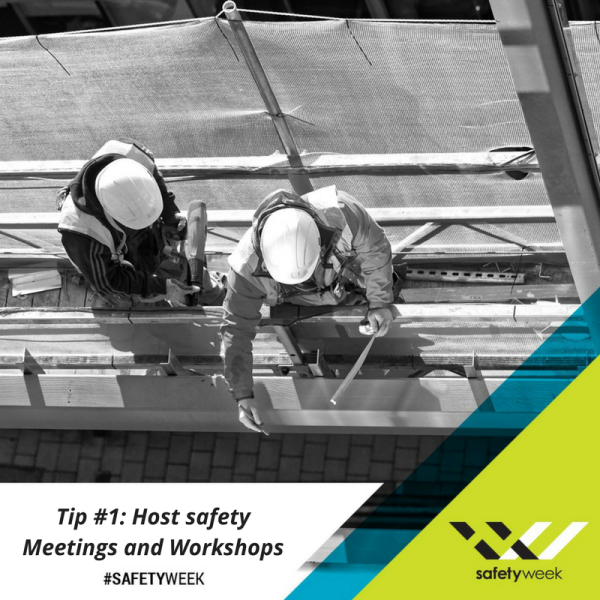 How Can You Take Part in Construction Safety Week 2018? As a professional in the construction industry, you can become a Safety Week partner or sponsor, and help spread the message of safety awareness on social media using the hashtags #SafetyWeek and #MySafetyPledge and encourage others to do the same. 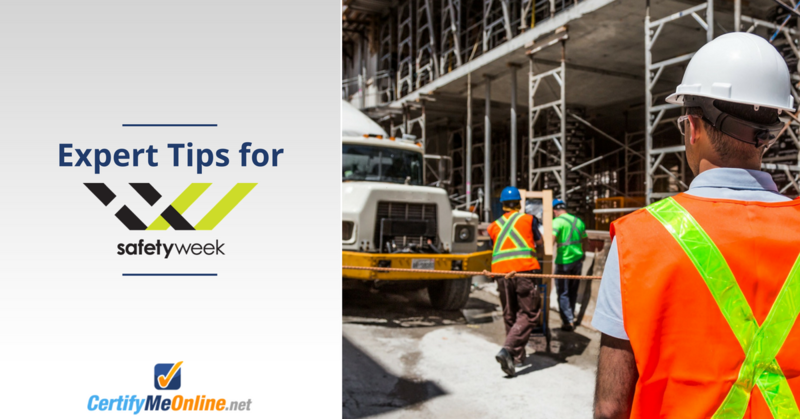 In addition to celebrating Construction Safety Week in these ways, consider adopting these special safety week and year-round safety tips we gathered from top industry experts. The LEVEL Construction team is also planning to hold Toolbox Meetings every day during Construction Safety Week to gather workers around the tool staging area to briefly discuss job site safety. It’s no surprise that construction sites contain many types of hazards that can cause injuries. Some of those hazards are falling hazards and exposure to harmful substances. Matthew Struck, the risk management and insurance professional at Treadstone Risk Management, has seen his fair share of liabilities and risky situations working with contractors and municipal workers. While fall protection is a big topic in the construction and heavy equipment industries, knowing how to properly respond to and handle a fallen worker is something not as familiar. – “Get going. Don’t stand around discussing what to do. – Stick to your plan. Now is not the time to try out new techniques. – Have your rescue gear easily accessible. Do not consider ascending and starting your shift without your safety gear on your person, and any required backup gear at its pre-set location. – Work smoothly. We accomplish a rescue quickly not by going fast, but by maximizing efficiency. Take your time and think through every move. If you rush, you could make time-consuming or even deadly mistakes. “The choices we make – big or small – can have a huge impact on our safety and the safety of those around us. This is especially true in the construction industry, where we rely on each other every day to stay safe,” says Chris Traylor, a construction industry professional. Last but certainly not least, we come to possibly the most important aspect of construction safety: quality training. When workers are properly trained and certified to operate heavy equipment, work around equipment, and perform tricky tasks, they are able to prevent the accidents that result in injuries and deaths on worksites. If you’re ready to make safety a priority in your workplace and put your safety plan into place, start with the top quality OSHA-compliant equipment training from CertifyMeOnline.net. “Quality operator training that not only covers all of the most important topics of operating heavy equipment, like aerial lifts, scissor lifts and forklifts, but is also compliant with OSHA standards is the number one most effective tool for keeping workers safe and reducing accidents,” says Tom Wilkerson, CEO behind CertifyMeOnline.net. To learn more about the online training classes from CertifyMeOnline, click here.